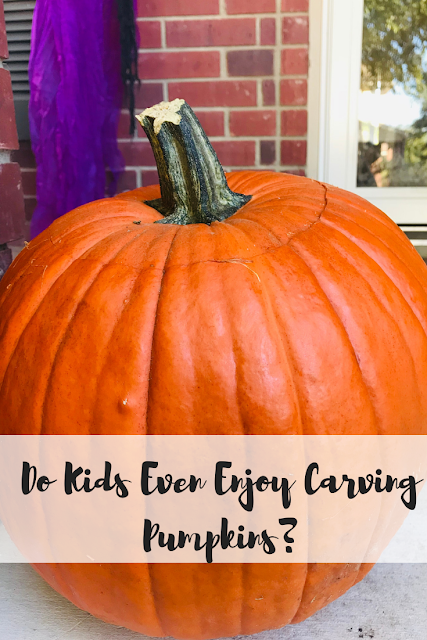 Airing My Laundry, One Post At A Time...: Do Kids Even Enjoy Carving Pumpkins? Do Kids Even Enjoy Carving Pumpkins? I admit, I don't like carving pumpkins. But I know my kids enjoy it, so I buy one every year for us to carve. And by us, I mean my husband. Or me, if he's deployed with the military. But the kids have to clean out the pumpkin. However, he has gotten better over the years. This year I bought a pumpkin, and my daughter Natalie kept asking when we were going to carve it. My husband wasn't in the mood. "I'll do it," Natalie offered, but I pictured her waving a knife over her head while shrieking, "I have the power!" and vetoed that pretty quickly. "We'll do it," I promised. "At some point." So the pumpkin sat. And sat. And sat. "You know Halloween is less than a week," Natalie reminded me on Friday. I was all, "Would you settle for this?" 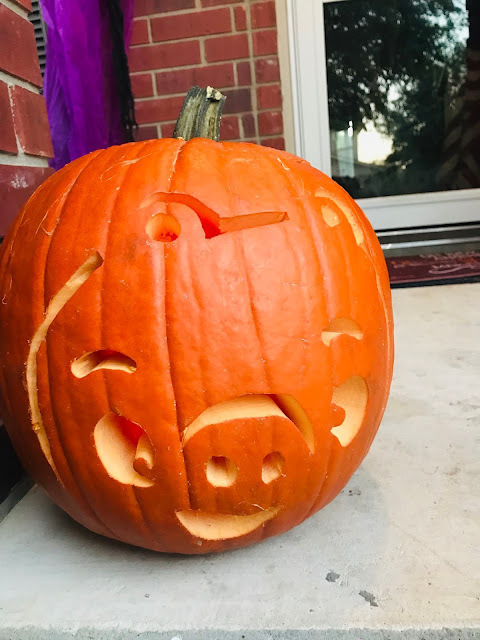 We decided to carve the pumpkin on Saturday. I told him I'd do it, and he was all, "No, you'll butcher it," and I reminded him I was in charge when he was deployed and he repeated, "You'll butcher it." Which is basically what I did to the pumpkin I was in charge of, but you know, I tried, and that's gotta count for something, right? 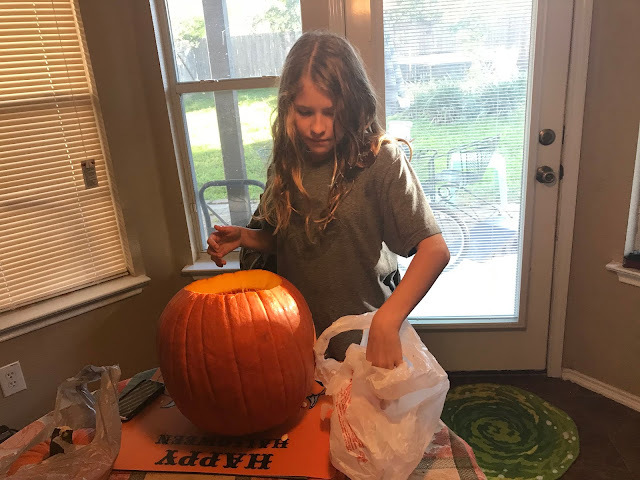 So we told the kids we'd carve the pumpkin on Saturday and I expected Natalie to be like, "Yay, finally," but she just shrugged and muttered out some sort of response. I've noticed tweens and teens like to grunt things. Tom opened the top of the pumpkin and was all, "Where are the kids?" and I looked around and none were to be found. "Tommy? Natalie?" I called up the stairs. I could hear Tommy was playing a video game. The gunfire abruptly stopped. "Yeah?" he asked. In his defense, Tommy didn't ask about the pumpkin. I don't think he cares one way or the other. But he was the one that came down and started to clean it. "Natalie?" I tried again. 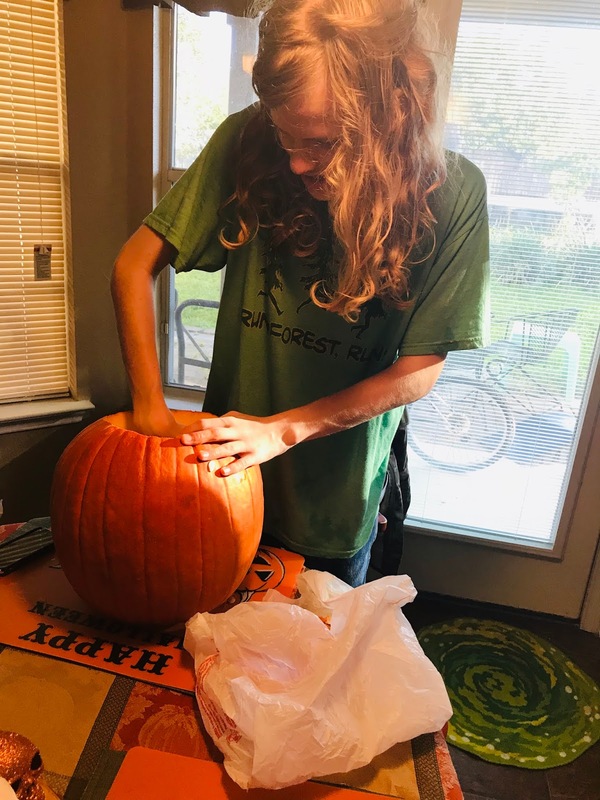 "Natalie, why is your brother with sensory issues the only one cleaning out the pumpkin? Get down here!" Then she had the nerve to groan and stomp down the stairs as though I inconvenienced HER. When SHE was the one begging for the carving to even happen. "I was in the middle of playing Roblox," she huffed at me. "We're doing the pumpkin," I said through clenched teeth. "Remember? The one you kept asking about?" Natalie sighed. "Ugh. I wasn't ready yet." "I don't care. Your father and I are ready--"
"Not really. No. I'm being forced to do it," Tom cut in. "Just. Clean out the pumpkin." I motioned towards it. Natalie gave me a Killer Tween Look--parents, you know the one--and went over to the pumpkin. The kids did clean it out. "Isn't this fun? We're making memories!" I called out sarcastically. I mean. Why do I even bother with the pumpkin anymore? Why? When the pumpkin was clean, Tom got to work. He asked why the pumpkin tools were all "crap and cheap" and I said to just do the basic jack o lantern style and he went, "No. That's boring," and continued to mutter about the pumpkin tools being "crap and cheap." Mind you, Natalie went back upstairs, so Tommy and I were left with a grumbling Tom. "Isn't this fun?" I asked Tommy. 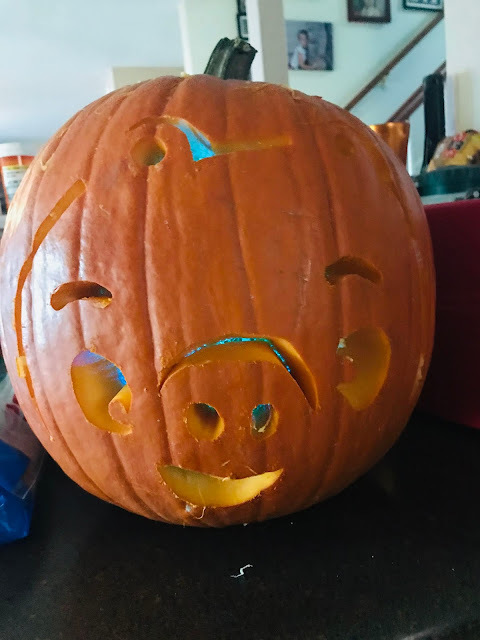 "THE PUMPKIN THAT YOU WANTED IS CARVED!" She came back down, looked at it, and went, "I like it! Thanks Daddy!" And then she went back up to her room. I don't. I mean. What? I'm not sure if we'll be carving a pumpkin next year. The kids are older. The allure seems to be gone. It took does look pretty cool outside. So maybe we will carve another next year. Ha ha ha. Those holidays where the thoughts of it feels better than actually day. As a teenager I did't carve pumpkins, I was more into the the costumes and make up. If you didn't have children would you still do it? I tried to tell my son if he wants to care one and all he said is the seed will be yucky and that I should do it then show it to me once I am finished. My kids HATE the carving & cleaning, but they love the finished product. And I sure as heck won't clean it out, so we painted pumpkins this year. LOL. I have kids who are happy to carve as long as the prep work is done. They hate the guts (as they call them). I think that is pretty common. It came out cute! That's funny Natalie was begging to carve it and then didn't even participate! That is really funny. I am almost to that stage where they are teenagers. I am hoping that my kids will always love to do creative things with me. I am pretty sure there will be some issues though LOL. 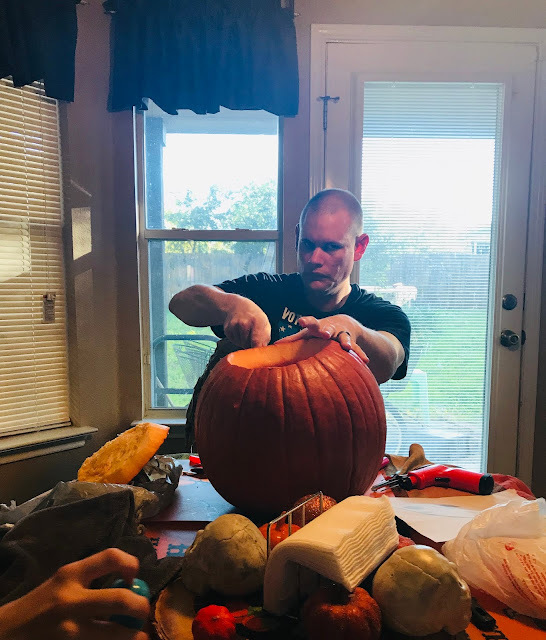 It is a lot of mess and work to carve a pumpkin. I think your kids just outgrew the allure. The last time I carved a pumpkin was when I was working on the 1/2 term activities at the wildlife trust, I absolutely hate it the smell the mess the yuck from inside haha! I bet kids like it but not the one who will stay to do the cleaning. I tried it once it just not for me, its just so messy. But i like saving up the seeds though. Don't you just love family bonding moments like those. The pumpkins were cleaned and carved and now everyone can go back to doing what they were doing. I can't recall ever carving a pumpkin, just drawing on one with a Sharpie in school ha. I can see how parents would end up doing most of the work though because of sharp objects being involved. That's too bad the kids weren't that excited when the time came. I don't think I've ever done it well! I've had help or I've gotten a kit. haha. None this year! I keep hoping they won't ask. At least the pumpkin looks cool! We did this last night. And you're right - us parents totally did most of the work! I loved carving pumpkins as a kid. I did slice my hand. That was before all the great kid safe carving tools. I loved carving pumpkins when I was younger. My kids do too! You have some great points! My kids still love carving pumpkins with me. We paint ours. Mostly because they just didn't love pulling the guts out and it gives them an excuse to paint something. My daughter gags when we carve pumpkins lol. She hates it. I love carving pumpkins with my family. It’s something that I look forward to doing every year. This is fabulous. I am well past this stage but my husband says he feels this like it was yesterday! That is beautifully craved pumpkin. I am not good at pumpkin carving neither my hubby. I bought pumpkin and some stickers for them to stick it on them that is what their carving this year. Well these Halloween traditions are fun to watch. Though we in India do not celebrate this festival, I can see why kids don't love carving pumpkin. Pumpkin is never hit with the kids. Way to be flexible! Halloween traditions are awesome when they work, and if it just boils down to you and your husband, so be it! We don't carve pumpkins anymore now that my kids are older. We only did it few times when they were younger. We did it for a few years and my son didn't like it too much. I do think it is a great family activity and he does enjoy the end results. I honestly don't know if mine really do because my husband and I do most of the work. My oldest loves digging out the seeds and such, but my youngest doesn't really like doing much at all. It's still fun to do and they love seeing how they turn out in the end. I had this thought this weekend as my husband was acting like a grinch over carving. He was making sure it wasn't fun for them. Haha, this really happens every pumpkin season. Sometimes kids want it easily but didn't know how to do it and even thought its so easy to do. haha!